Our land touring this year followed on naturally from last year's SE Asia tour of Northern Thailand, Laos, Vietnam and Cambodia. 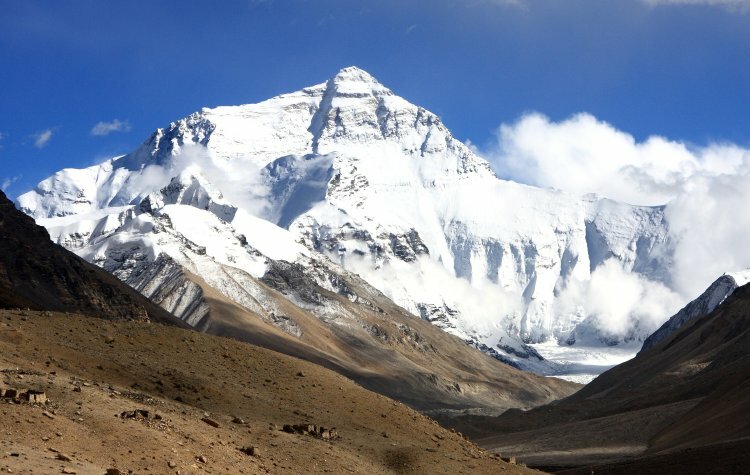 This time we took a cut across the central region through China, over the roof of the world on the Tibetan plateau to Lhasa, then via Everest to the land border with Nepal where we had timed our arrival for what we hoped would be the start of the trekking season. Having survived ten days on the Annapurna trail we chose to return overland through India, flying back to KL from Calcutta. 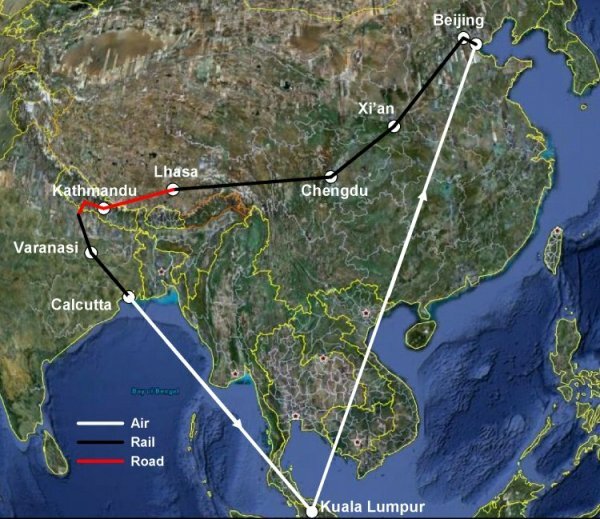 By our reckoning we travelled around 5,622km overland (3,513miles), of those 1960km in China, 2270km in Tibet, 430km in Nepal and 962km in India. As we did for our story of last year's trip around SE Asia, again we have seperated out the people related images from the tales of our travels. They can be found in a Peoples of Asia page accessible also in the archive of Updates, Marine Life and Latest News which can also be reached by the link at the bottom of our Homepage. 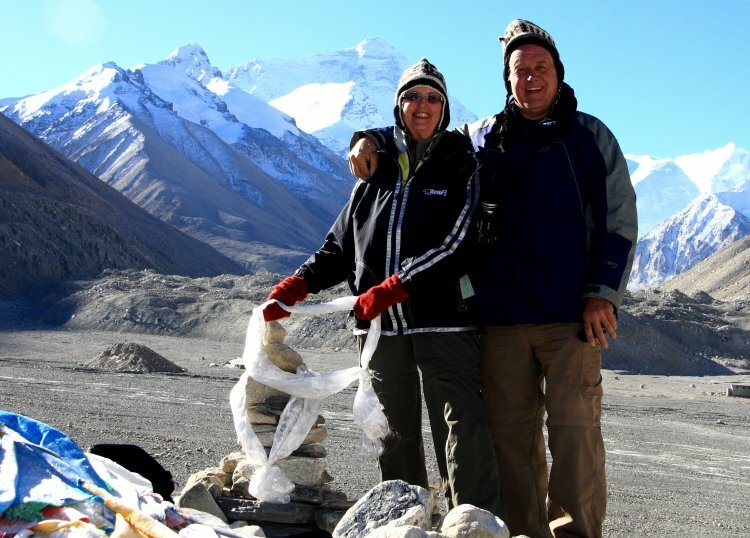 Back in Feb'09, we had mentioned to Alistair and Vivienne, Kiwi cruising friends on Largo Star that we were planning a trip across China and Tibet, culminating in some Nepali trekking. That was similar to their plans so we combined, shared the organisation and the heart of a team was born (LHS four in the picture below). We also have to thank the Brit crews of Iron Horse & Kirsten Jayne for their inspiration, as they did the Tibetan rail trip in 2008. Next to Alistair is Philippa, Vivienne's sister from Rotorua who came as far as Chengdu and Russell an old friend of Alistair's who came as far as Nepal for a mini-trek. Our Air Asia flight touched down at Tianjin around 135km SE of Beijing, from where there is a convenient 'Bullet Train' connection. We were expecting to find the infrastructure had been enhanced for the 2008 Olympics but from the moment we arrived we were to be amazed by what had been achieved over the last couple of decades. The train sped along almost silently at speeds of around 257km/h (160mph). Central Beijing is the most modern of cities with virtually all buildings recently replaced and to Di's delight, excellent public toilets everywhere. We were exceedingly fortunate to have had an introduction to a charming, 26yr old, post-graduate IT student called Lee Fang who took us under her wing, showing us her city with great pride and most importantly tutoring us on how to negotiate the extensive bus and underground system. Our first full day was devoted to the Forbidden City (so named as it was off-limits for 500yrs), Tiananmen Square and the central shopping area which conveniently were all within walking distance of our hotel close to the Bell and Drum Towers in the old town. 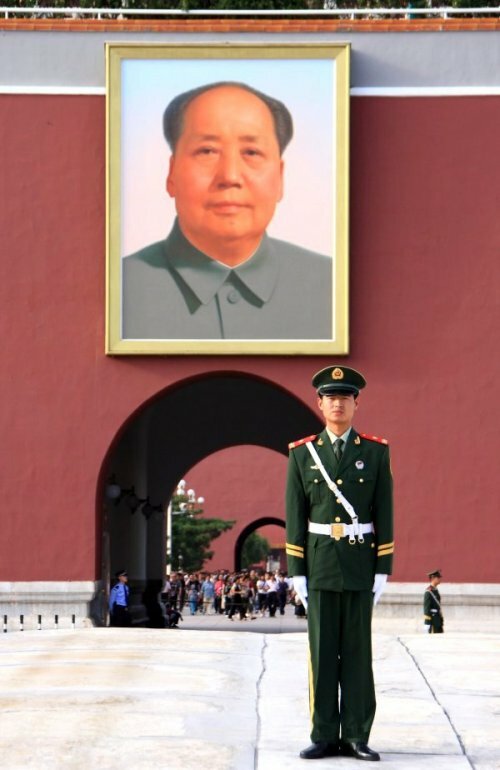 The picture is of the southern gateway, dominated still by the image of chairman Mao. The PLA, Peoples Liberation Army (or perhaps more appropriately, the Party's Loyal Army) are omnipresent, here and throughout China. We were about to discover they were even more prolific in Tibet. Tiananmen Square is just over the main eight lane highway from the Palace, so one can vividly conjure up the image the student confronting the tank there in 1989. 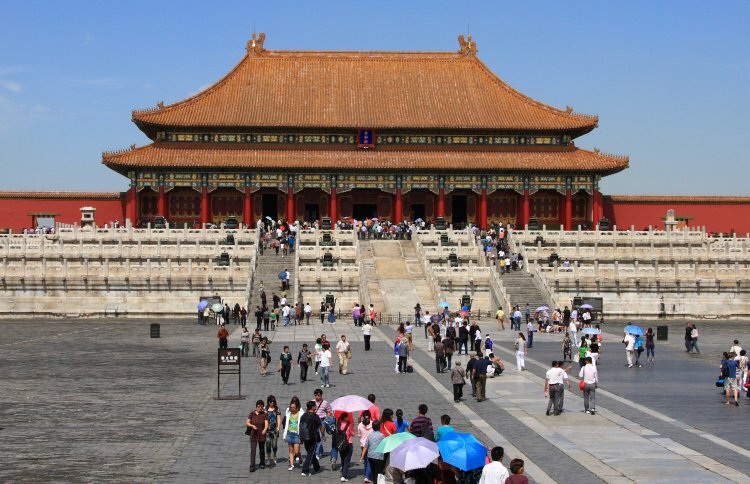 The Forbidden City is a huge walled compound built between 1406 and 1420 by Emperor Yong Le commanding an estimated one million labourers. 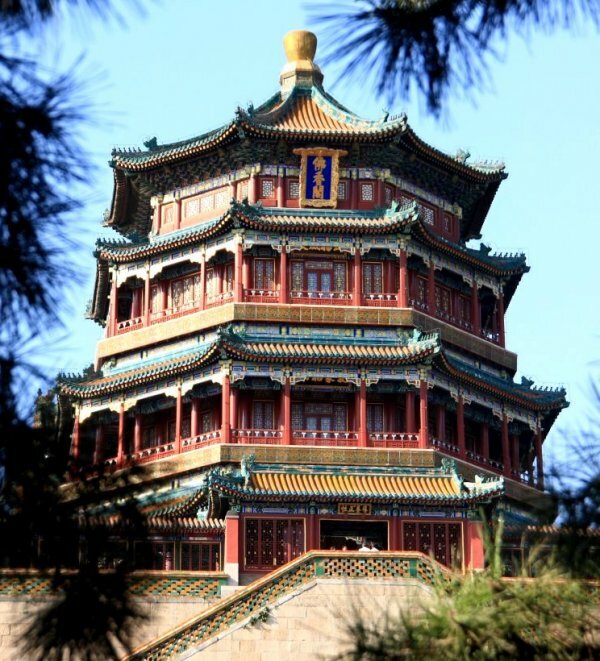 It was home to the Ming and Qing dynasties as well as the centre of all power in imperial China. It comprises a series of temples accessed by a central, NS route through from gate to gate with dozens of administrative buildings on the periphery. One could easily spend more than one day touring rooms and special exhibits but for us a morning was all we had allowed. 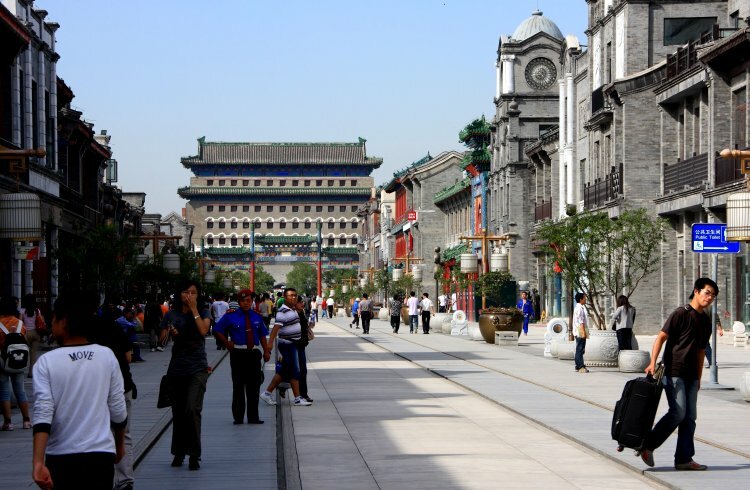 Down that road past Mao's Mausoleum, the Monument to the Peoples Heroes and across takes you to Xuanwua major shopping district with many old and even more new stores. The street below was very new with most businesses just in the process of opening. The grey bricks are typical of the region which we guess means the clay around those parts is grey. When we asked Fang about this she was surprised bricks came in any other colour, especially red! Our outing next day was to the Old Summer Palace, also now known as the Winter Palace which has a low profile with locals as it was the scene of a sacking by a joint British/French force in the second opium war of 1860 (must be about the only time we worked together with the French!). There were some nice lotus covered lakes and fountains in the over 2km wide grounds. After lunch we did the true Summer Palace with its immense grounds, lakes, temples and stupendous views over the new city. It was rebuilt by Empress Dowager Cixi in 1888, reputedly with money earmarked to build a modern navy. One can walk for several kilometres alongside the lake, much of it within the splendid walkway decorated with mythical scenes. 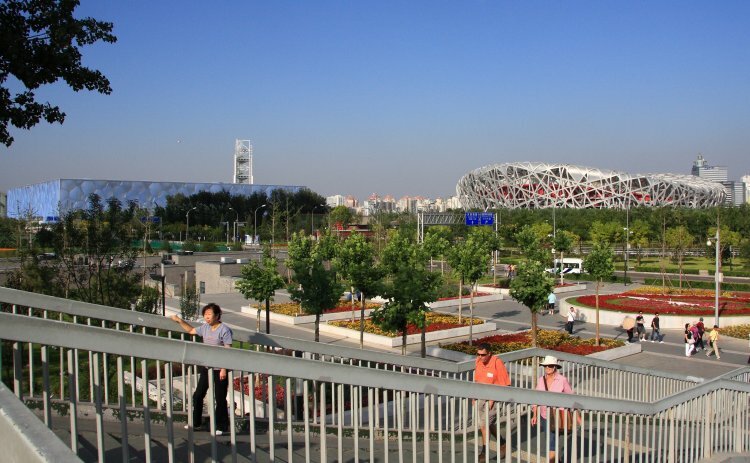 The 2008 Olympic site is surprisingly close to the city centre, just to the north on the central axis line encompassing the Bell/Drum Towers, Forbidden City and Tiananmen Square. The low rectangular blue building is the swimming pool with the impressive main stadium structure to the right. Within, it appears much smaller and more intimate than the impression given watching events like the opening and closing ceremonies on the small screen. 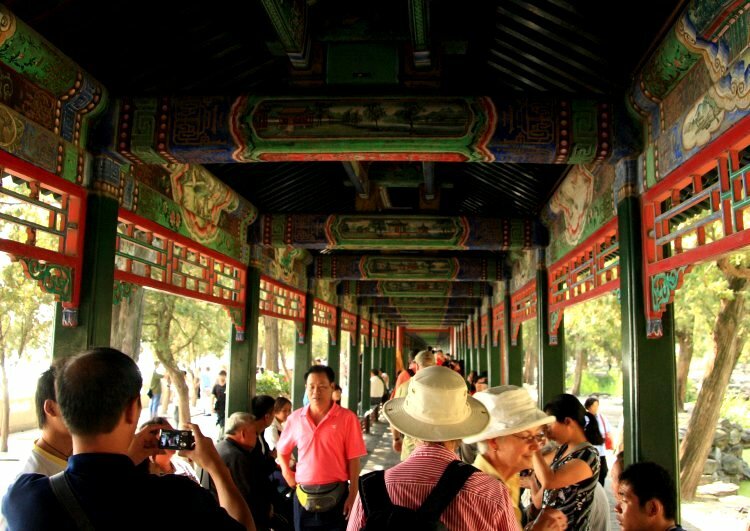 Another must is the Temple of Heaven within its 267 hectare park. 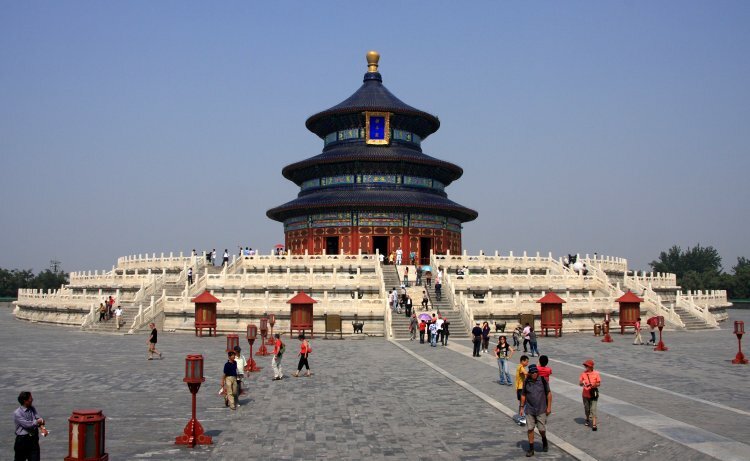 The Hall of Prayer for Good Harvests is a supreme example of Ming architecture originally functioning as a vast stage for solemn rights performed by the Son of Heaven, who came here to make sacrifices, pray for good harvests and seek divine atonement for the sins of his people. There were around six temples and sights focussing on the annual performance of these rituals. 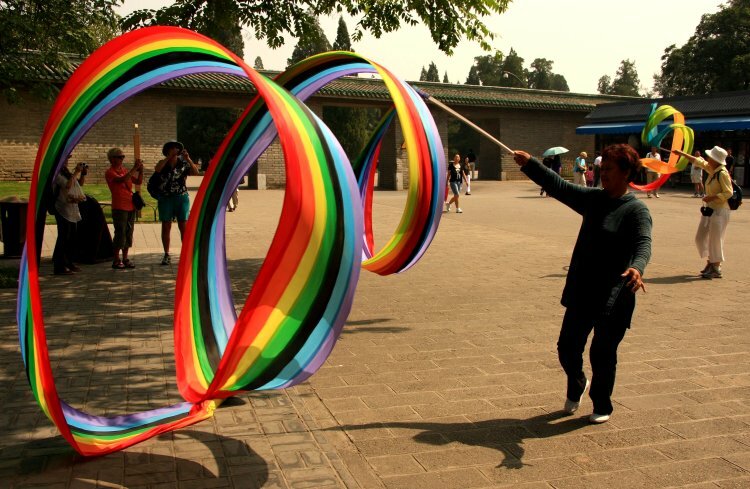 The park is a major chilling out place for the populace with groups playing chess, indulging in card games, nefarious gambling or just waving these colourful swirling cloths. In the background Di and Vivienne are taking pictures whilst Philippa is getting into some swirling. Naturally we reveled in the chance to sample as much real Chinese cuisine as possible, from wonton bars to this rather special place by the Xi Hai Lake that did a very good line in roast duck. 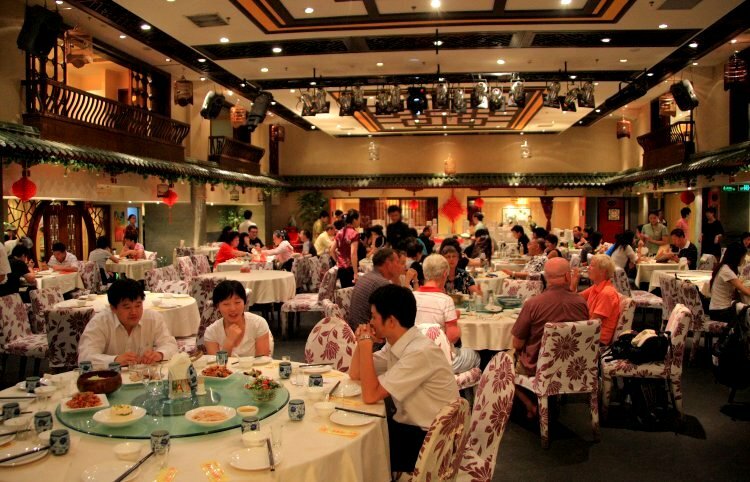 The 'real' Chinese food in local eateries was often different from the offerings in restaurants abroad which made eating out a much more interesting experience. In many places our problem was knowing exactly what was on offer and how to go about ordering it. Invariably there was no menu as locals knew what the fare was and the order could only be made in Chinese. In one place though they had an ingenious scheme. Having established what language they were dealing with, they emerged with a small pack of white cards with the name of the dish in English on one side and Mandarin on the other. Just a question then of stacking up the cards. 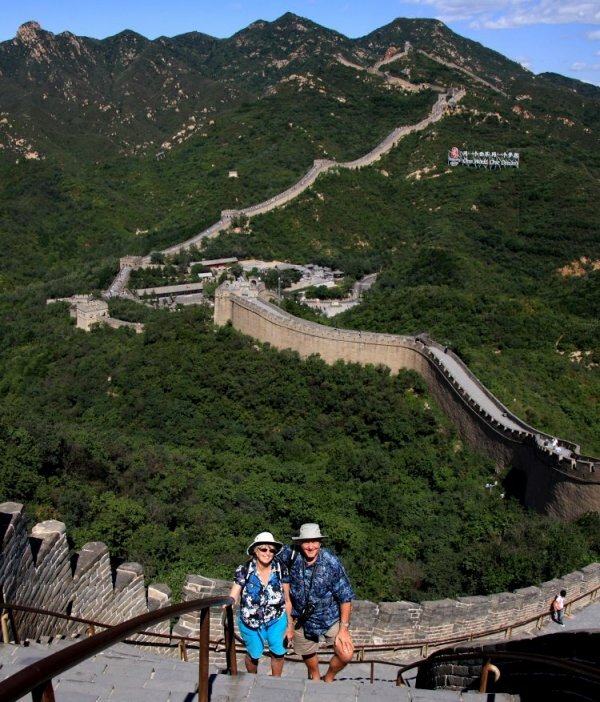 A very special trip was our visit to the Great Wall at Badaling, a 70min ride on a fast 'Bullet Train'. It was a very clear day with a strongish wind so wandering along the wall with its steep inclines was a bracing experience. Around 8,850km long, it stretches from the east coast to the Gobi desert and it is claimed to be the only man made artifact visible from outer space. Building first began after the unification of China (221-207BC) but this section near Beijing was only constructed 500yrs ago and has been the subject of much recent refurbishment. Even so, the whole structure is naturally quite awe inspiring. Just try to imagine troops on horses, six abreast tearing along the narrow pathway between the walls. In the excellent nearby museum one can learn not just how enormous in extent this wall was but also about other examples around the world like our Hadrian's Wall, miniature in comparison. 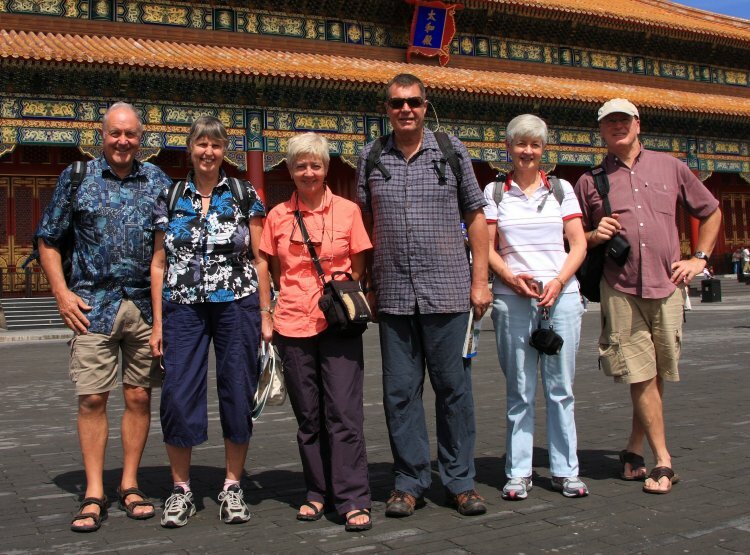 We did so much more in Beijing over eight, very full days, exploring big attractions, obscure observatories and hutongs (narrow lanes of single storey buildings). Interestingly, we discovered a massive area beginning at Tiananmen Square, going north alongside the east wall of the Forbidden City that had been razed and rebuilt as high class hutongs for Party Apparatchiks. These merited large communal underground carparks and secluded, spacious courtyards, some with fountains. At 07.00 on Wed 16th Sept we were awakened by oriental campers music after a sound night's sleep aboard the express to Xian, an ancient capital of China. Travelling the long distances by night sleeper is a great way to go, as not only do you save on travelling time but get there for less than the cost of a night in an hotel. We arrived after another 90mins to a dank, hazy 19C day. The haze is pollution which seems to dog every city of any size outside Beijing that we saw in China. Even there, after all the factory closure program leading up to the Olympics we had the odd uncomfortable day. Our hotel was conveniently set near the heart of the city's attractions so by day we discovered a Wal-Mart as well as a superb restaurant for lunch. By evening we were recovered enough to hire bikes to perform the 14km, rectangular circumnavigation of the 14m wide, 12m high walls of the old city. This offered great views of the city to both sides on the 100min ride, especially after nightfall. 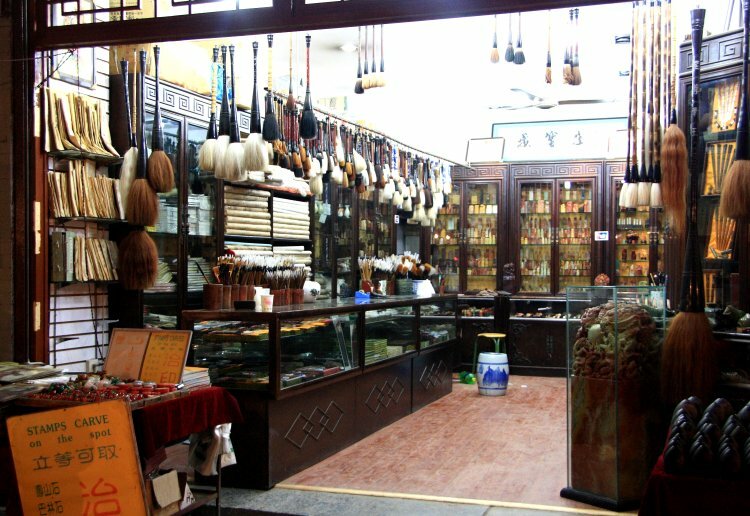 Thence to the night market in the Muslim quarter where we came across this lovely brush shop. As Chinese written characters generated manually use brush strokes these are important tools. Our reason for stopping in Xi'an was to visit the entombed army of terracotta warriors at Xianyang about a two hour bus ride outside the city. We were not disappointed and took over four hours visiting three excavations which resulted from a chance find when a farmer was digging a well in 1976. Below is Site #1, the biggest (210m x 60m) with over 6,000 statues, each one with differing facial features and expressions. They are arranged in battle formation facing east and originally held spears, dagger axes and other long-shaft weapons, being accompanied by 35 horse drawn chariots. For the techi-photo-nerds, the picture below is a seven-image, vertical format stitch! 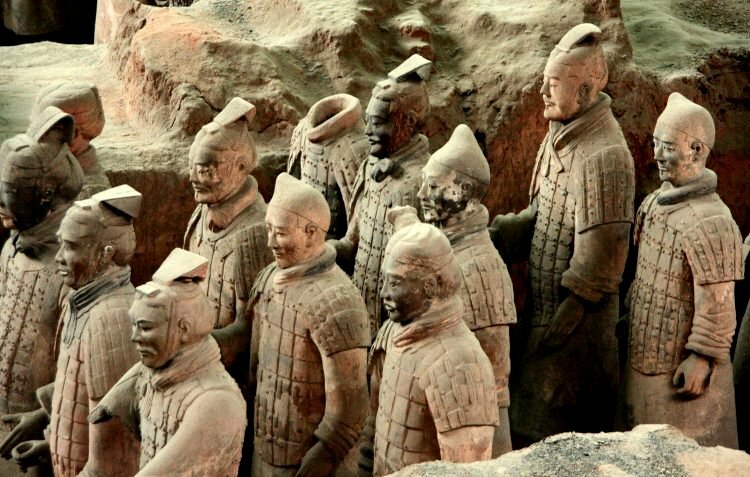 They were set there to defend his tomb 1.5km to the west by the so called 'First Emperor', Qin Shibuang who united the country in a bloody campaign in 221BC. It has been estimated that over 740,000 workers laboured for 38yrs to manufacture the life size figures and build the 5-7m pits with wooden roofing. A truly mind-blowing enterprise. Back on the sleeper carriage again, we headed for Chengdu were we arrived around 14.00 and in the evening discovered the essence of Sichuan cuisine. If it says 'hotpot' it really means incandescent to a point where you suffer complete taste-bud-shut-down. Barely recovered we set off next day for the renowned Giant Panda Research & Breeding Centre just outside town. We were unsure what we would see but were overawed by the extent and complexity of the grounds. We had several hours to observe around 45 pandas in various stages of development as well as a plethora of research and breeding detail. They were playful and apparently very happy with their lot. 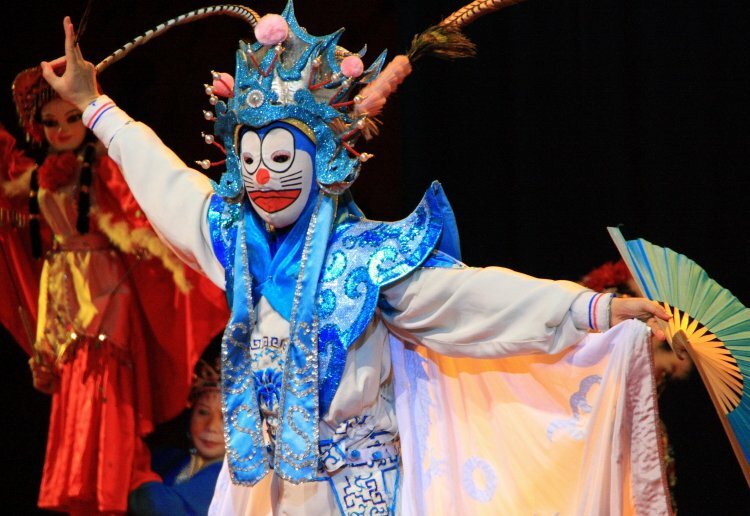 Also in Chengdu we were able to attend a performance of the Sechuan Opera which featured incredible dramatic, musical and juggling skills. Most memorable was a violinist with a traditional two stringed instrument who gave unparalleled life to classical works and the mask-switching of actors and puppeteers who changed over faces faster than the human eye could follow. 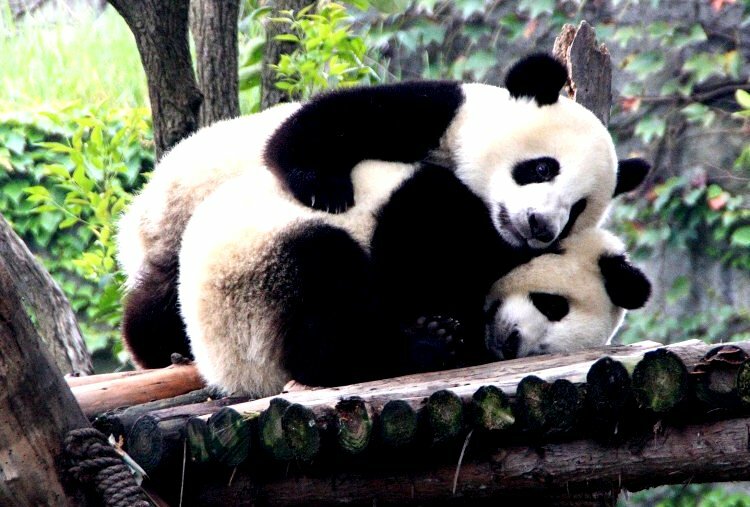 Chengdu was sadly the place where our, by now close-knit team changed as Philippa returned to New Zealand. We also needed two others to make up the numbers to fill the two Land Cruisers we had booked for Tibet to travel from Lhasa to the Nepali border. Thanks to the Internet we found and took aboard Andy from Canada and Orla from Ireland, a recently married couple whose honeymoon was a 12 month world tour. After a day spent in the old town it was time for what we all considered to be a high-spot of our journey, literally. Awaking this time on the sleeper, not to flat featureless scenery, we found ourselves in very mountainous terrain. Deep valleys dropped away into the distance with around 70% of the track within tunnels and a further 5% over bridges. 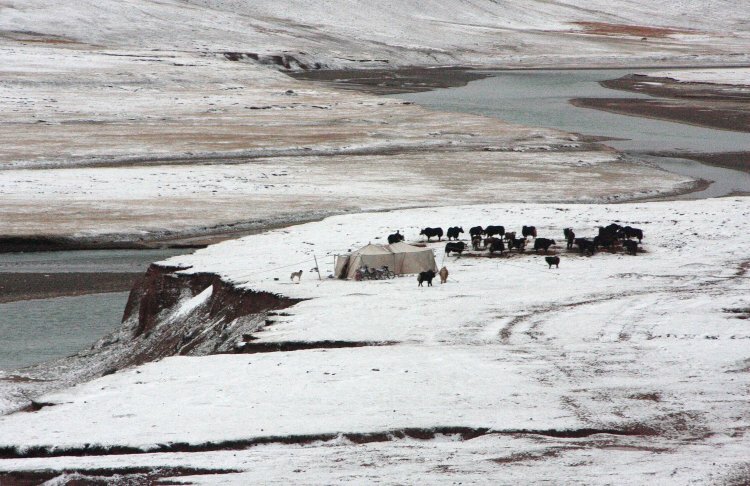 We sped onwards all day and by nightfall were getting high onto the remote tundra with the occasional tent encampment surrounded by herds of yaks. On Wed 23rd Sept we awoke after our second night aboard to a frozen world of permafrost, mountains and frozen lakes. 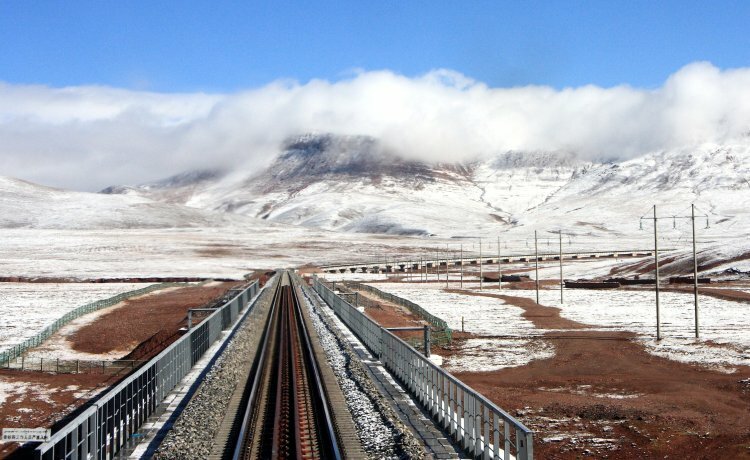 We were well along the Qinghai-Xizang railway inaugurated on 1st July 2006, the world's highest, reaching an altitude of 5,072m (16,640 feet) at the Tanggula Pass. 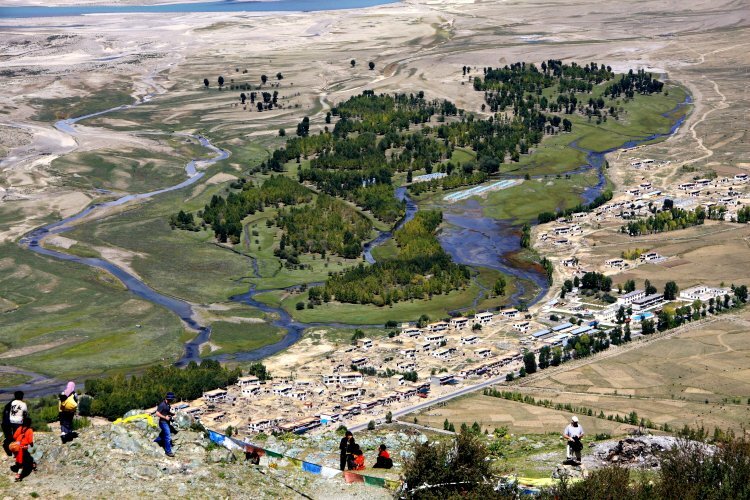 In all it is 1956 km long and over 80% of the Golmud-Lhasa section is at an altitude of more than 4,000m. There are 675 bridges, totalling 159.88 km, and about 550 km of the railway is laid on permafrost. What these statistics really say is that it was a mammoth engineering achievement in one of the most inhospitable regions of the planet. Such is the risk of altitude sickness on the journey that each person has an oxygen socket and pack of tubes to plug-in should it become necessary. There are also hyperbaric chambers on several stations along the track. One wonders how those constructing the track fared, particularly in the harsh winters. 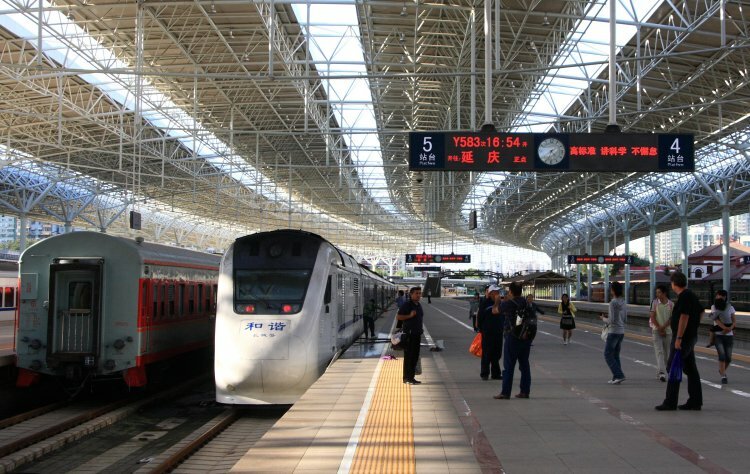 After 43hrs aboard we alighted at the modern station in Lhasa, the erstwhile remote capital of Tibet where the evening wind was bracing, if not bitingly cool. This seemed to be a city like no other. For so long isolated in the high mountains of central Asia, most people in the street have strange mongul features. 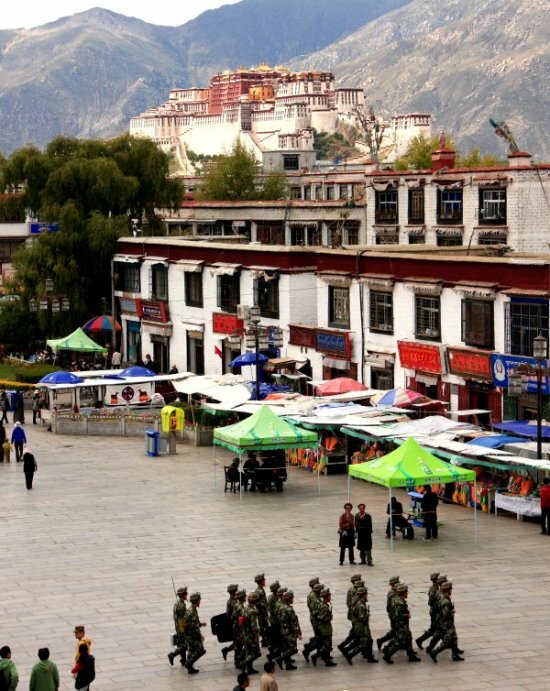 Whilst in Tibet we are minutely controlled and watched by the Chinese security and military whose controversial 1950 invasion is still the subject of popular unrest. We must have a guide/minder with us virtually all the time and it rumored that 9pm is curfew time. The problem is that these rules are imposed without written guidance (to avoid bad publicity) so you don't discover what you can and can't photograph until the hand appears before the lens. So, when atop the ancient Jokhang temple (built around 1400) which commands a superb view across the square in the old Barkor district, one is confronted by plain clothes security guys making sure you don't include in your pictures the troops marching menacingly below with batons and riot shields. Strangely, the 'plain clothes' guys all wore the same yellow T-shirts! 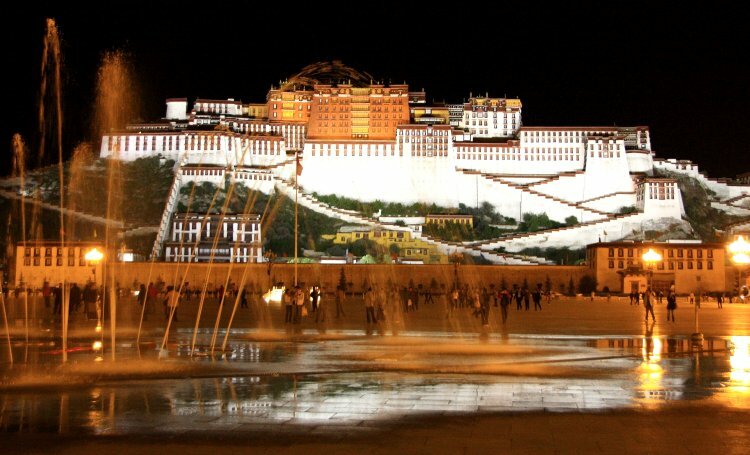 The city is dominated by the impressively imposing Potala Palace which before the invasion was the centre of the government and winter residence of the Dalai Lama. Founded over a thousand years ago, the present structure dates from the 17th century. 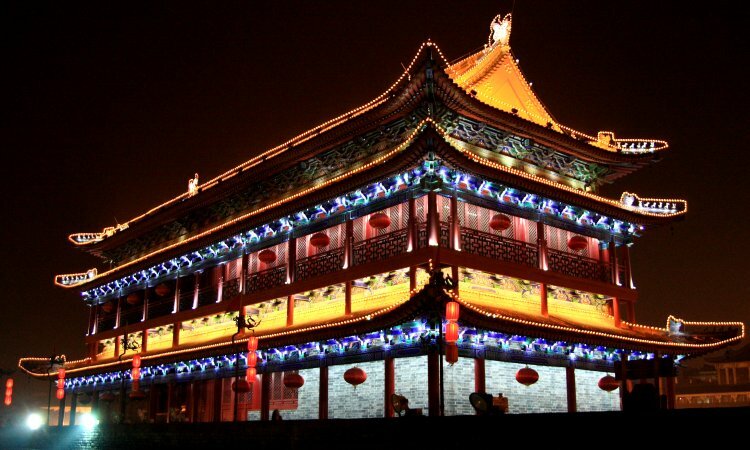 It contains thousands of rooms, the upper part being known as the Red Palace, used for religious purposes and the lower White Palace for administration. 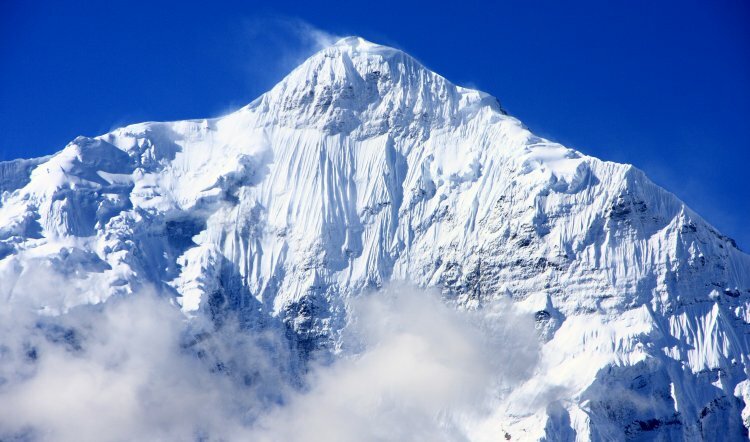 Getting up the steep flights of stairs to gain access is quite a challenge, as at an altitude of 3,600m, as without adequate aclimatisation the body is depleted of oxygen. Atop the palace are a maze of temples and living quarters, all very sacred to local pilgrims who make a point of touching every surface that may have been blessed by the passing robe of a past deity. 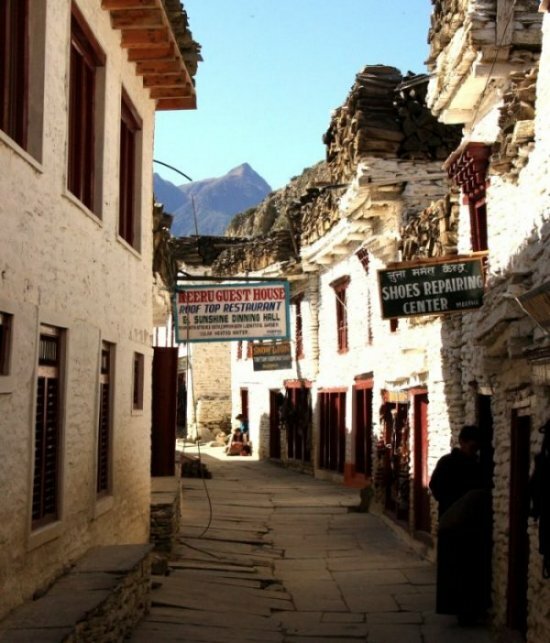 The city is a strange blend of old and new, the latter being the wide streets between the Barkhor and Potala Place, lined with designer label shops run by the mainly Han Chinese who arrive in their hundreds by train every week as part of the policy of cultural dilution. We gathered that children learn only Mandarin at school and Tibetan nationals are not allowed a passport until the age of 65. An 80min coach trip up the valley, culminating in a tortuous 1,000m, zig-zag climb to a 4,500m hill top took us to the famous Ganden Temple and Monastery. 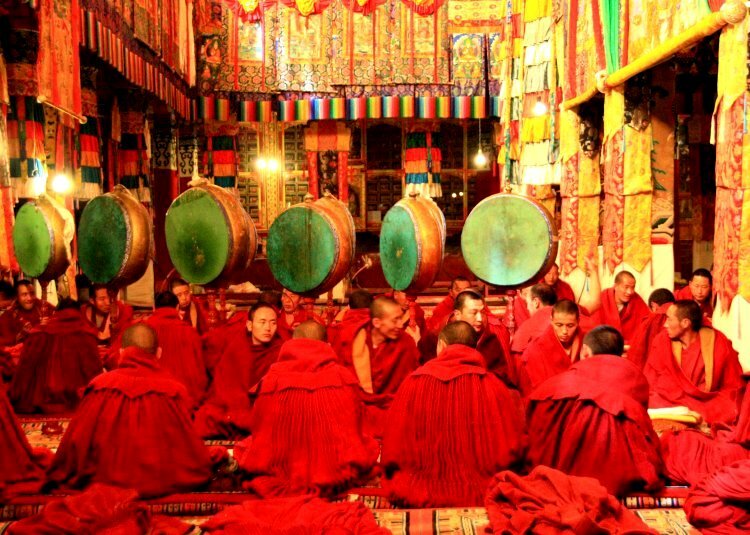 It was a stupendous setting for one of the six most important religious sites of Tibet, known as Gelugpas. Amazingly, by chance we had arrived on the one major ceremonial day of the year so were treated to a staggering display of robes and chanting backed by cymbals, drums and long thundering trumpets. All the 800 or so monks seemed to be out in force, celebrating in every corner of the huge complex. The abbot led the service, punctuated by the clashing of large cymbals, whilst we felt very humble before such a lavish outpouring of devotion but the monks took us in their stride, the obviously senior one below even managing a wry smile. Over the last few years Dave has branched out into making and editing high quality sound recordings in MP3 format. Beginning with a laptop, which has obvious portability limitations, he now has a superb little Olympus LS-10 stereo, linear, PCM recorder which slips in a pocket and produces astounding results. It really came into its own that morning so there is a mountain of recorded material to work with when time allows. This Buddhist temple is renowned as the home of the founder of the 'Yellow Hat Sect', housing the most sacred of statues and religious relics. 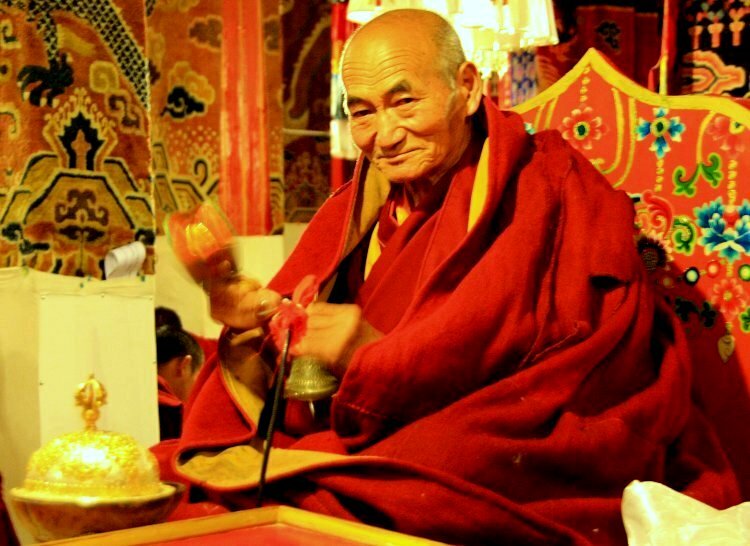 We worked hard to understand the relationships and intricacies of the various deities, their special areas of activity and significance but found that aside from the basic Dalai/Panchan Lamas and three Buddhas (past, present and future) we were often in uncertain territory. In the picture below, Russell is responding to a call of nature at one of the worlds more elevated facilities where between the two boards was an unfathomable drop. 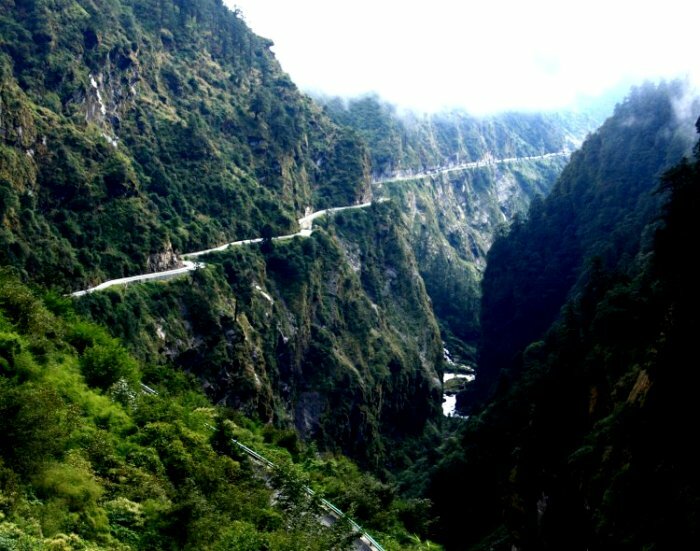 However, the view around and down onto the top of the access road was a remarkable distraction from the feeling of vulnerability. In the afternoon we tackled the Kora, a clockwise walk of pilgrimage along a rough track around the circumference of the hill with unbelievable views down into the valley below. Not surprisingly the sensations were more those of being aloft on a magic carpet than being earthbound. 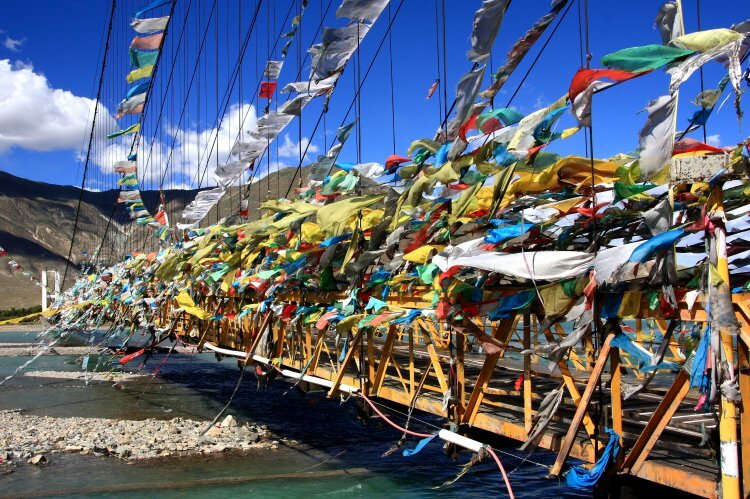 On the way back into Lhasa we passed this 'local' bridge across the main stream that was covered in prayer flags making for a great picture. Shortly after we were subjected to what was probably the nearest any of us has knowingly been to a serious head-on collision. One of a convoy of Chinese army trucks suddenly swerved out towards us, whilst several cries went up as we all braced ourselves for the impact. How we missed it we will never know, the gap between us was literally a few millimetres! Army convoys are very common, often with backs loaded with troops. They stick close together with hazard lights flashing, seemingly ignoring traffic lights or the existence of other traffic. After four days in Lhasa we reluctantly set off in the relative comfort of two Land Cruisers for the 500km trip to the Nepali border via the Everest Base Camp. The road was good, traffic light and there were three major passes to cross, La Lungla the highest at 5,200m was the same altitude as the base camp we were heading for. We also skirted a section of the huge Yamdrok Yumta lake which had several large fishing boats drawn-up, high and dry above the current water level. 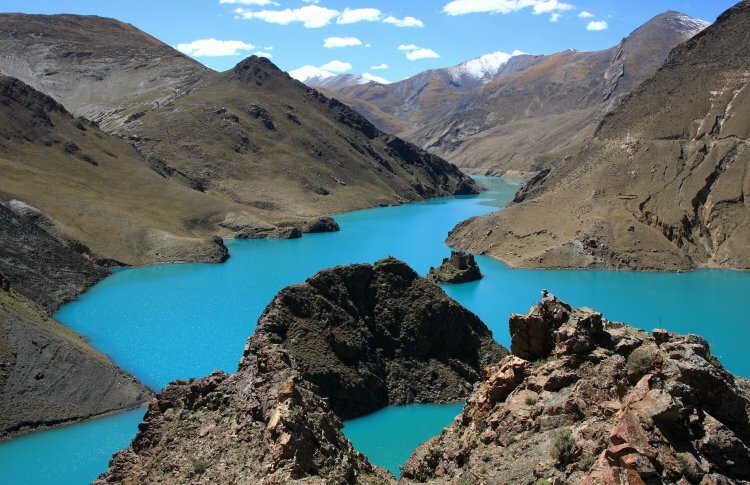 High up, further on beyond the Kharola Glacier (5,560m) was this dammed lake with a hydro power station that had striking, iridescently turquoise water. 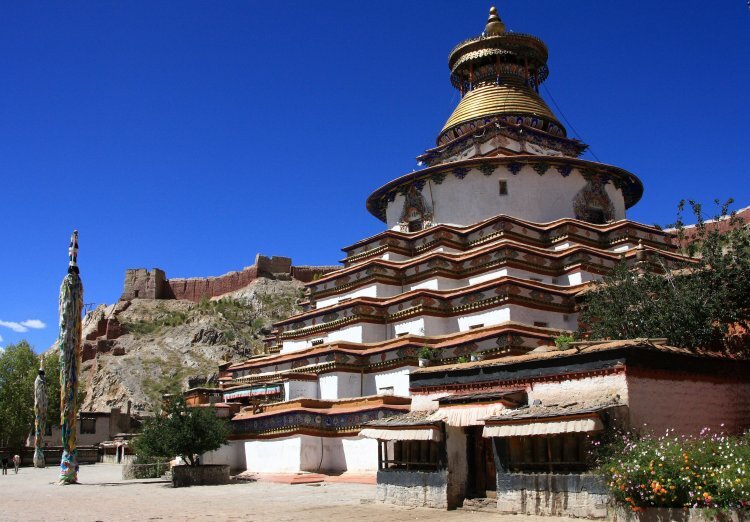 We reached the small town of Gyantse in the early afternoon, spending around an hour at the interesting Baiju Monastery which looks out across the town to the impressive Dzong (castle) atop a steep hill. The route along the valley to Shigatse took us through rich agricultural land where wheat harvesting was underway. 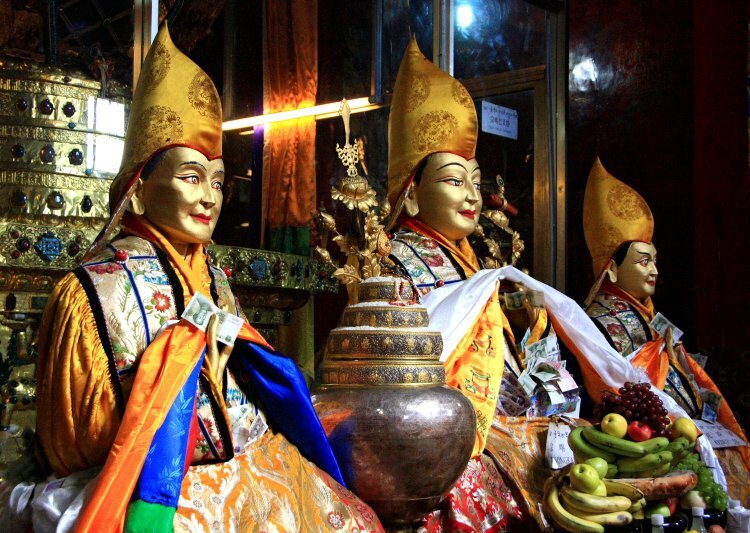 We spent two nights there, exploring the Tashilhunpo Monastery built in 1447, another of the major Gelugpas. After lunch next day we turned off the major highway onto the 95km track leading to Everest and late in the afternoon the tension and worry over cloud activity was dispelled as we caught a first glimpse of the magnificent North Face. The night was spent in a large, comfortable tent at the Base Camp at around 5,200m. It was very cosy with a central stove burning a mixture of dried yak and sheep dung. Early next morning we set out for the last 5km leg to the nearest point to the peak we were allowed to visit. There was even an army camp there to regulate our every move. 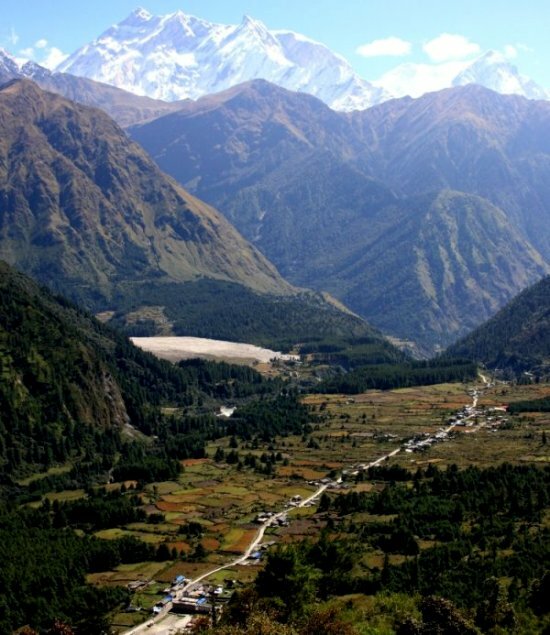 We left the base camp around noon on a different route to Old Tigri on the main road west. It was tough, rough going through wild, arid country punctuated by the odd group of nomads with their yaks and desperately poor villages (squat square buildings with chimneys on each corner with prayer flags attached). We ate a late lunch at Tigri where we met an Aussie/Kiwi group before speeding on down the 'Friendship Highway' toward the border. We lost altitude rapidly on an amazing road cut into the hillside of a massive steep sided gorge. 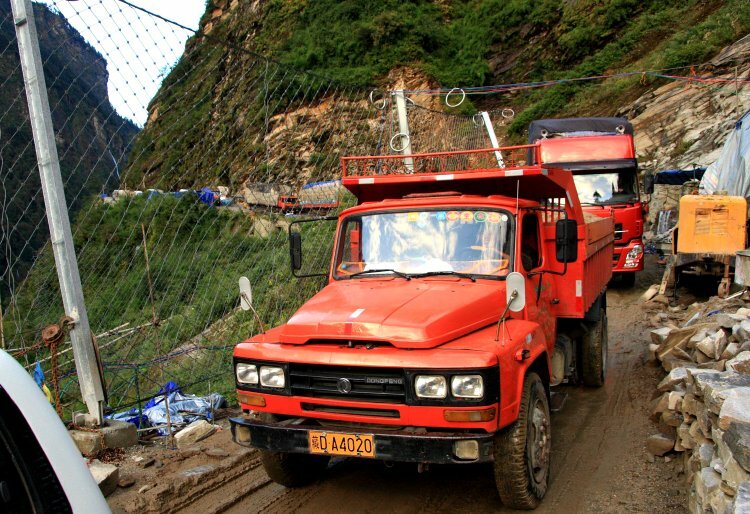 However, our high spirits were suddenly dashed when just 15km from Zhangmu, the border town, we came upon a long queue of trucks backed-up at a big landslip (just visible at the far right of the picture where there is a large brown scar on the hillside). It took over 2hrs to get through but we discovered how lucky we were when we learned the road had only been opened for 24hrs at noon that day before being closed for a further three days and traffic was moving down when we got there! Then we had to fight our way through the chaotic town streets to find all usual hotels full. After a long delay our guide found rooms in a grotty hotel with running black water at around 9pm. Next morning we arrived at the 'Friendship Bridge' border crossing at 08.30 for the 09.30 opening. Even though only 100m from front of the queue we had to wait over two hours before it was our turn to have all our bags searched by officious Chinese Army border guards. It became obvious all they were interested in was written material from Tibet (every page of every book was checked). The Aussie/Kiwi party we met at lunchtime the day before had a problem. One of them was found to be carrying an old itinerary with a Tibetan flag as part of the header. He was hauled off and interrogated for 75mins, then the whole party was formed up into a tight group before being marched to the red line at the bridge centre, surrounded by weapon toting soldiers. The most paranoid over reaction imaginable. After all that performance, the frightening 5hr bus ride to a very polluted but free Kathmandu was an anti-climax. 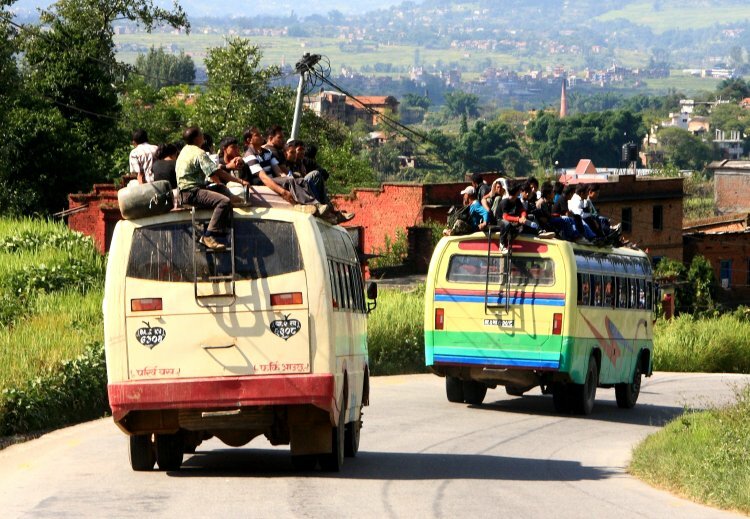 Buses in Nepal never depart until they are completely full, top and bottom! Kathmandu is a crowded place but fortunately we had booked a friendly, quiet hotel in Thamel, the heaving centre of a huge tourist area thick with craft and trekking shops. 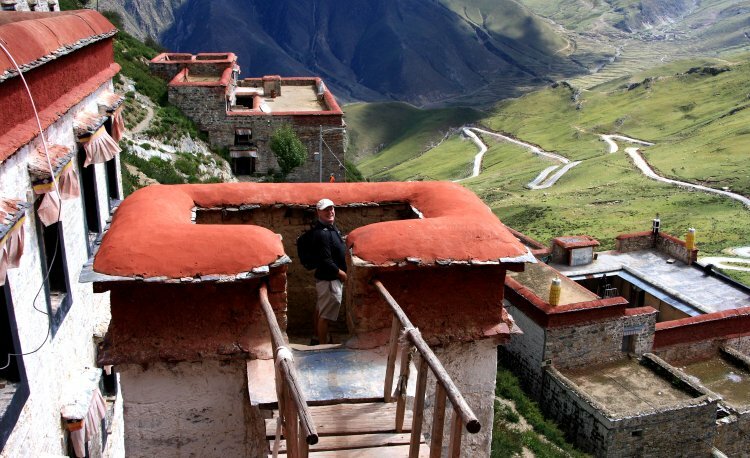 After the remoteness of Tibet we found ourselves surprisingly tolerant of the hussle and bussle. Durbar Square is the home of a fascinating collection of densely packed ancient buildings and relics, all in a generally poor state of preservation. We suspect the three characters below were not as they seem but just there to 'shake-down' tourists. 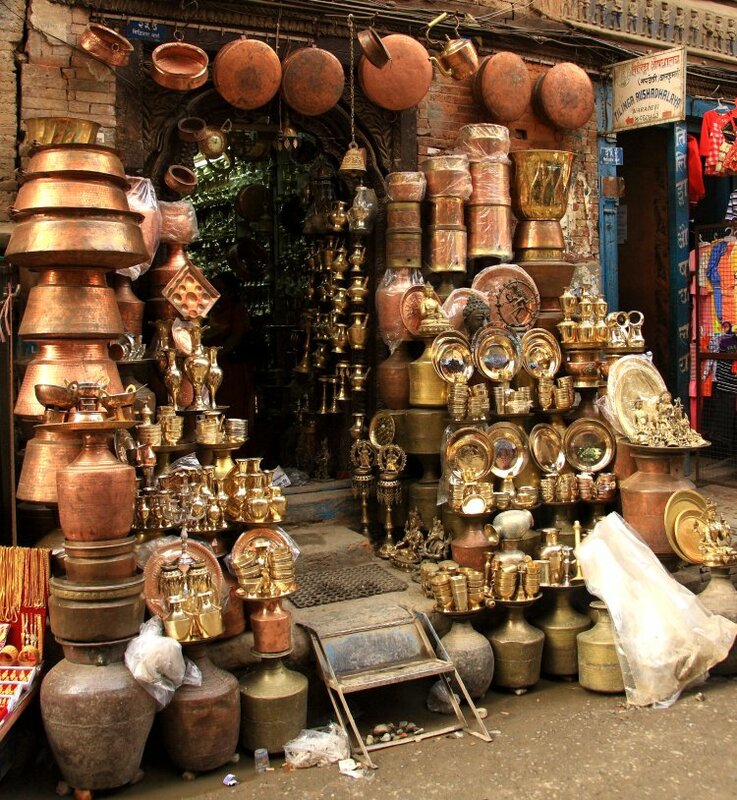 The narrow streets of the city are home to a fascinating array of specialist shops such as this purveyor of copper pots and brassware. No problem for us though as Amoenitas is full so it is easy to browse without temptation. 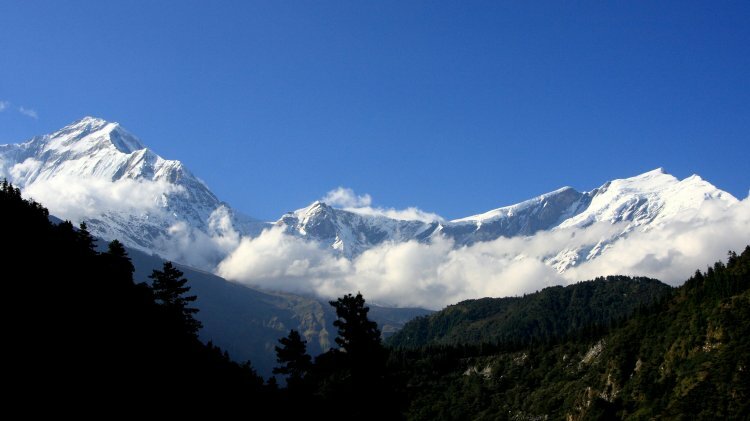 Pokhara, the base town for trekking in the Annapurna region is a 7hr coach ride outside the capital. Alistair and Vivienne had more ambitious trekking plans so set out the day before us. By the time we had bought permits and readied ourselves for the off, the whole country was subjected to 40hrs of continuous torrential rainfall caused by high atmospheric mixing of a monsoon system to west with a cold jetsteam from the east. As a result our flight to Jomson was cancelled, so next day having lost our priority we were relegated to the last flight at 09.00, rather than 06.30. Finally we were airborne at 10.10 which was bad news as the winds that blow up the deep mountain valley had already set-in. 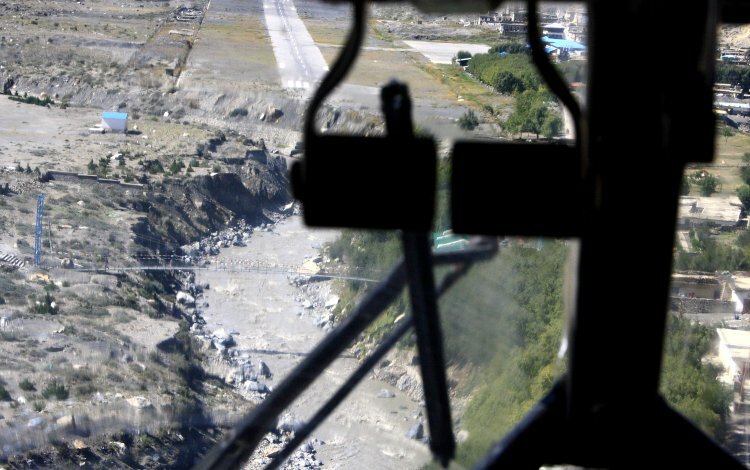 The final approach to the small airstrip was punctuated with several massed sharp intakes of breath during moments of negative-gravity, followed by a bumpy landing to the accompaniment of many cheers from the around 30 passengers of the cramped DH Twin Otter. How Dave managed this picture he'll never know as the Canon 40D is a heavy beast so holding onto it, let alone composing a picture was quite a challenge. We began our trek by a 3hr walk up rough, riverbed tracks north to Kagbeni, a charming village with a substantial monastery, surrounded by a relatively large area of productive agricultural land. Next day we hauled ourselves and packs up a steep climb gaining an altitude of 750m before calling a halt at Jharkot. 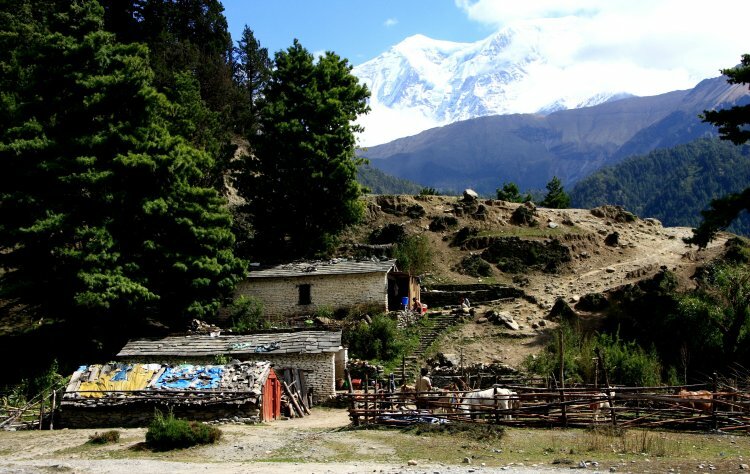 This was a small, working village set precariously on a protruding outcrop that was less popular with the many trekkers coming down from the Thorung La Pass. 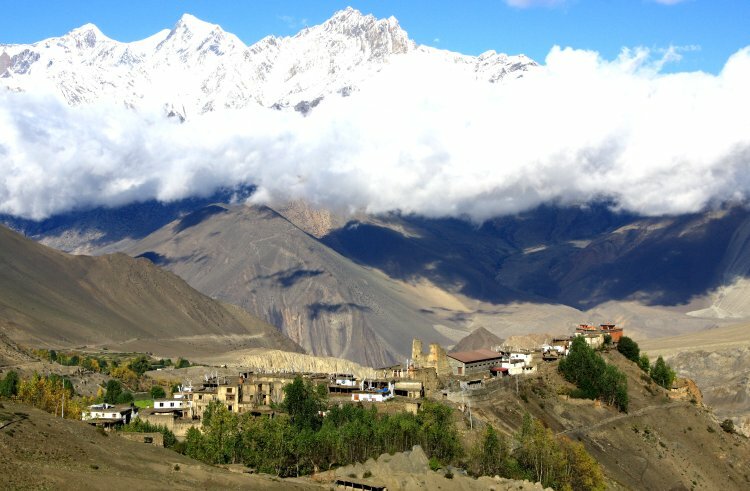 Next day we walked up through Muktinath to the famous Hindu temple. which at 3,900m was our highest point on the trek. Sadly it was a tad too renowned as it was inundated with jeep-borne Hindu pilgrims who transferred in the town to motorbikes for the final 1km leg to the temple. Priests were very active ministering to the faithful who also bathed in the holy water from the bank of 108, cattle head pipes (l08 being a suitably propitious number). From there we could see up to the very shear side of the Thorung La Pass which was covered with snow and wondered how our Kiwi friends would make out on the descent. Later we learnt that they had been thoroughly soaked in the downpour, taking several days to dry out. During the period they were on the trail five people died, a Frenchman from a rockfall, two on the snow and two from altitude sickness. Relieved we weren't up there we returned to Jharkot to visit the 550yr old Saky monastary. A thing one needs to do regularly, particularly at the start of the day is scan the horizon for snow capped peaks that may have been obscured by cloud the previous afternoon. 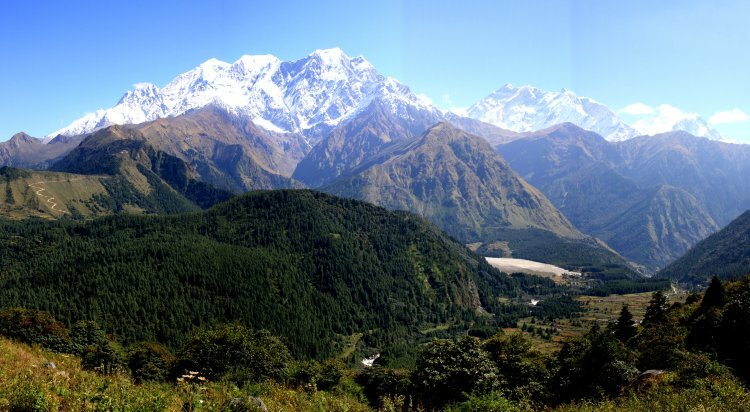 A case in point was this superb view of Nilgiri which appeared beside us on the climb to Jharkot. From now on the trail led downwards but not monotonically so. We set off from Kagbeni at 06.50 as the headwind sets-in at around 09.00, blowing at up to 20kts in constricted passes. We had breakfast of croissant and Danish pastries at Jomson before following the riverside path to Marpha, one of the wealthiest and well kept villages in the region (receives a lot of support from the Japanese). Below Marpha there are plenty of opportunities to avoid the dusty road by following riverside tracks or crossing over to the other bank of the river on breathtaking suspension bridges. The first time we did this we walked for two hours through beautiful pine forest which apart from the constant roar from the nearby river, felt just like being at home in the New Forest. A typical day's trekking for us was a 4-5hr walk, finishing for a late lunch at a lodge that still had lots of rooms free. At Kalopani we decided to do the Dhulu Danda climb up a precipitous path to the south side of the trail. Di wisely stopped after around 15mins, Dave continued up for a further hour or so, reaching a high point with this magnificent view of the three Nilgiri peaks. Further down the climb the view along the trail was equally spectacular. We continued for 3.5hrs after lunch on a very steep downhill road, very rough in parts to Ghasa. A pretty tough 7hr day by our standards with a deal of rugged climbing. Just another reminder here that you need to keep looking over your shoulder every so often to check whether yet another stupendous view has appeared round a corner. By 20th Oct we were all ready to leave Pokhara on the 07.00 bus for the Indian border at Sunauli on what turned into an 8hr bouncy trip through cavernous valley/gorge scenery. Just before the border we decided to detour 25km westward to spend the night at Lumbini to visit Lord Buddha's birthplace. Next day we headed for the border and our first encounter with India. The first indication 3km away was a queue of trucks waiting to enter India but offering no real impediment but after crossing the border it was another story. Seated twelve in a jeep designed for six, it took over an hour to clear the chaotic 500m of traffic jamming the Indian approach to the border. The road on the way to the railway at Gorakhpur was no less chaotic with pedestrians, cyclists, hand carts, rickshaws, motorbikes, tuktuks, oxcarts and cows, not to mention trucks, buses and other jeeps. All weaved amongst and between at a speed that left one gasping and incapable of observing. Somehow we arrived safely in the late afternoon traffic chaos of the city. 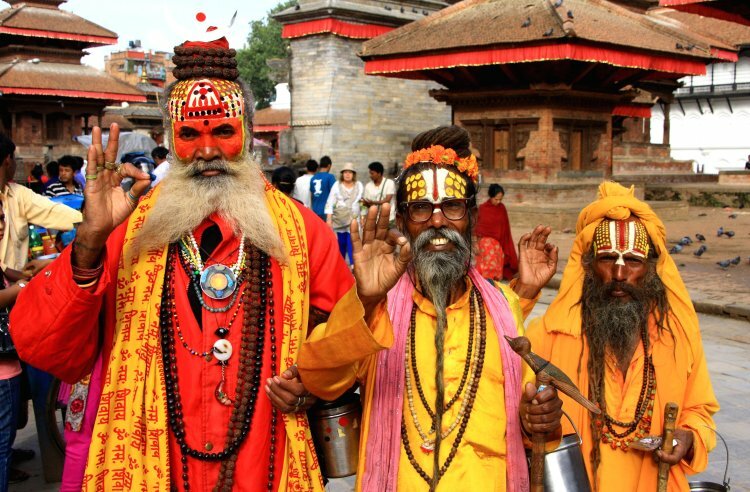 India is certainly a culture shock, even for we seasoned travellers. The crowds, chaos and dirt of all types piled everywhere almost defies description. There are some near unique features like the alternative energy industry we saw below beside the rail track into Varanasi. Not so much 'Nutty Slack' as 'Tangy Turds'. The lady is patting what is probably oxen dung into flat cakes against the ground, them arranging them is several different configurations as they dry-out. 'Tangy Turds' a possible answer to a future world energy crisis? 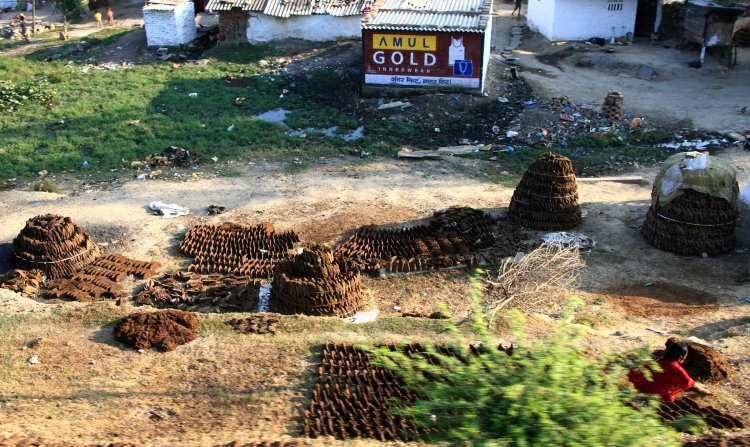 One does not get the best impression of India from the railway, as below where rows of shanty villages line the way into Varanasi. Several cows had found their way onto the station platform there, even though it was isolated within a mass of railway lines. Being sacred animals they cannot be removed so one trod very carefully. Whilst were awaiting the train to leave for Calcutta we had a challenging positional decision. Where to stand between the foul stench of human faeces on track and the marauding rats from the wall trying to eat our luggage! 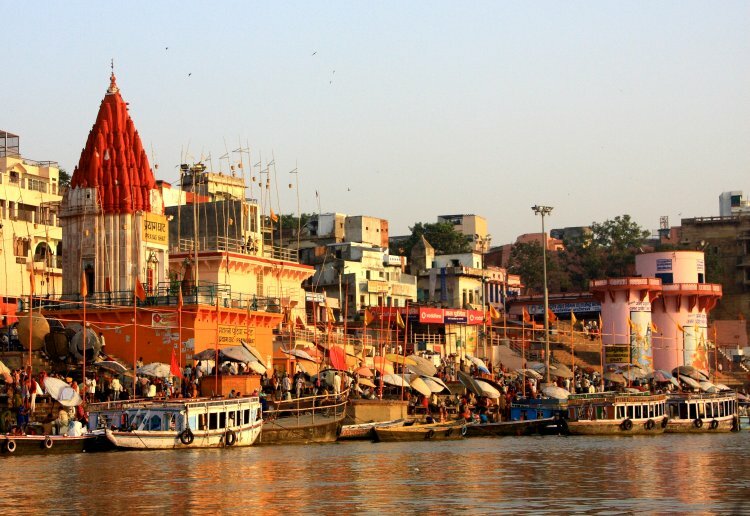 We had chosen to stop at Varanasi as it is one of India's most important religious centres where Hindu's go to bathe in the sacred River Ganges or even have their body's cremated on a pyre on the bank and ashes cast upon the waters. We duly set out at 5am for a rowing trip out to observe the sun's rising above the river and to mix with the pilgrims. 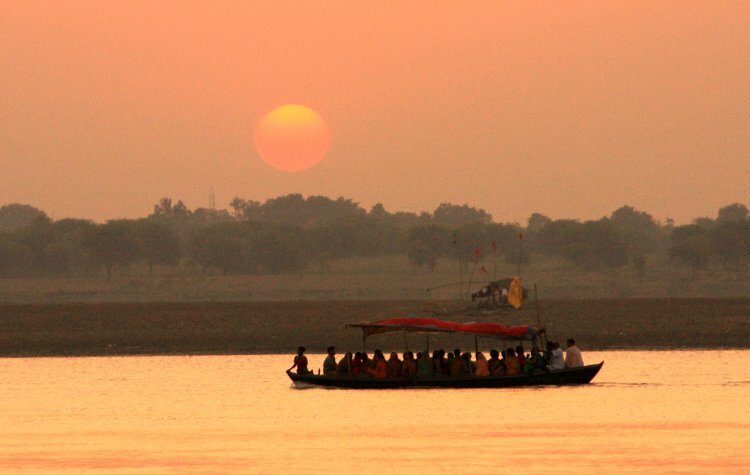 The river banks are lined with ghats, steps leading down from palaces built by former maharajas, rulers and princes. In the early morning pilgrims gather in their hundreds, maybe thousands to immerse themselves in the holy if not clean waters. It is not the most private of devotions but very popular nevertheless. Moving on by sleeper train we arrived in Calcutta, a city heaving with humanity, all mostly very impoverished. We noted that very little in the way of repair and renovation appeared to have been carried out, probably since independence in 1948. 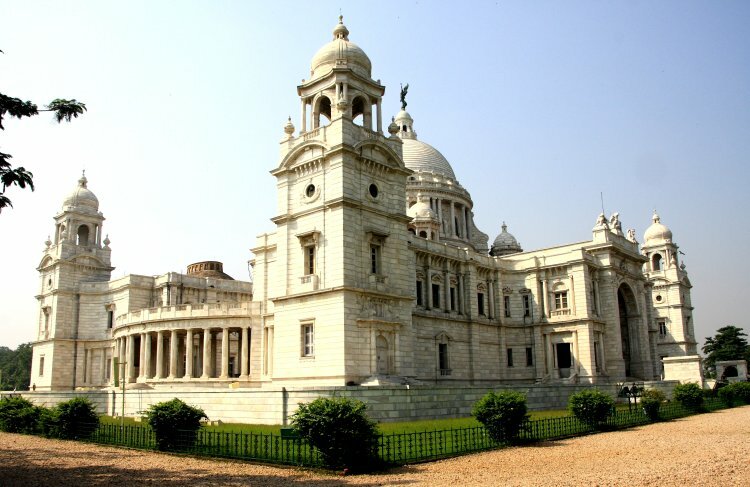 One exception was this magnificent memorial to Queen Victoria that was completed in 1904. Within was a wonderful collection of statues and paintings depicting Indian culture and society before, during and after the colonial period. The wide Hooley River that flows swiftly through Calcutta to the sea at the huge delta region is crossed by two bridges. 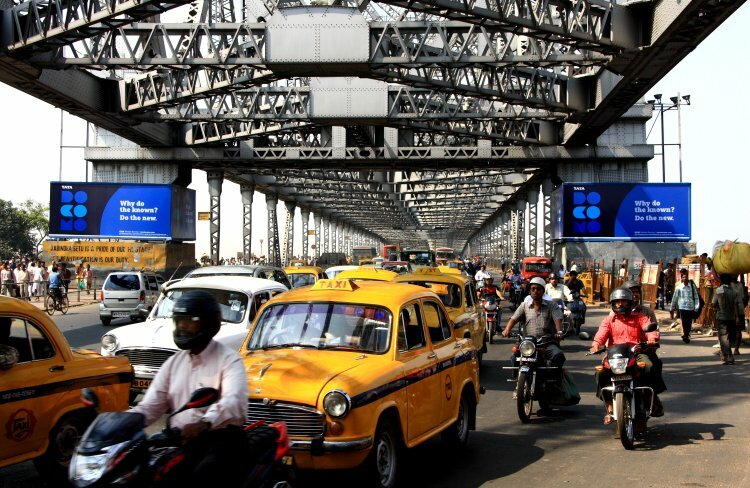 The modern one to the south has a modest toll and is largely traffic free whilst the old pre-independence Hooley Bridge carries an immense load. The eastbound traffic stream below is fairly typical with about 50% of the four wheeled vehicles being the ubiquitous, yellow Ambassador taxis. These robust 1500cc cars were known originally as British Leyland Morris Oxfords (Dave passed his driving test in one in 1963) but for decades have been produced locally. 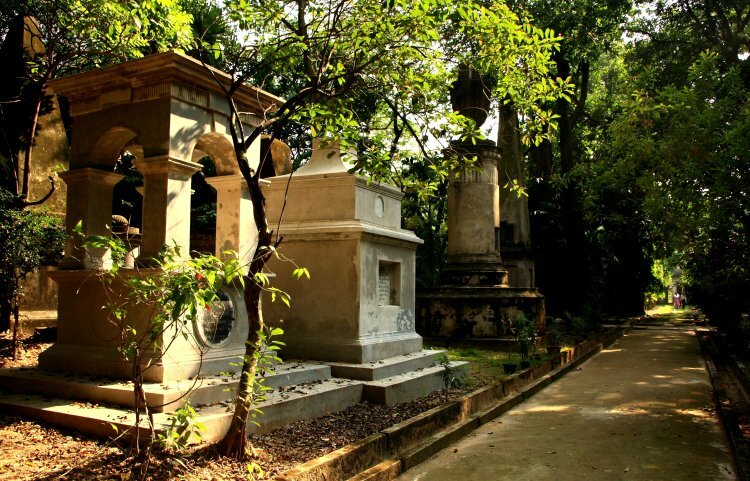 To end on a peaceful note, below is a scene from the Park Street cemetery in Calcutta where the early settlers were buried from around 1800. Not surprisingly in a climate such as there was with malaria rife, most inscriptions suggested those that survived into their thirties were doing fairly well. 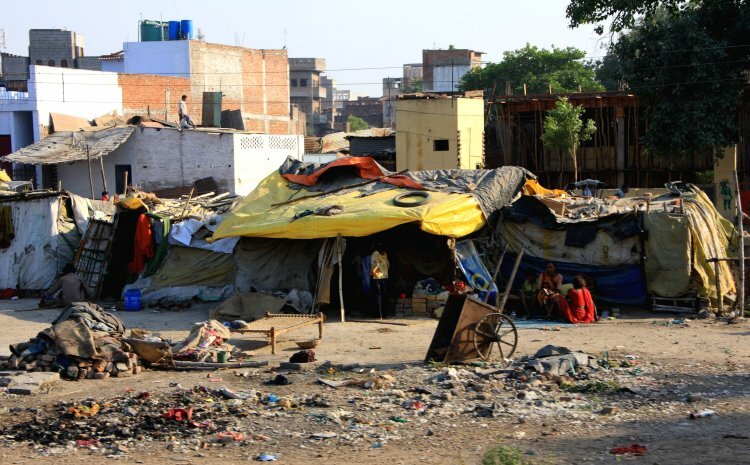 Our taxi ride to the airport confirmed that poor housing and depravation extends beyond 20km from the city centre. The airport at Bangkok where we changed planes and Kuala Lumpur our eventual destination were like different planets. Amoenitas is about to leave Rebak Marina heading north for Phuket in Thailand with our Kiwi farming relatives aboard. They will leave in mid December to be replaced by old friends from university days who with their daughter will be spending the festive season with us. In the New Year we will head up to the islands close to the Myanmar border, via the Similans where we will get our snorkeling and diving fixes. After that we thought of going on another 300nm to NW to the Andaman Islands, owned by India. Checking-in and staying for any length of time there is problematical but the diving is reputed to be superb, worth any inconvenience. We'll return to Rebak around the end of March and be back in the UK fairly soon after. The plan is to go back to live in Greenacres for six months or so to sort out some more substantial internal renovations. Life in this part of the globe being as easy and appealing as it is, we still have not managed to generate any enthusiasm for returning to Europe. Lets face it, the economic gloom, not to mention the even more unsettled state of the seaways off Somalia makes staying on here an even more attractive prospect. The plan at the moment, in so much as we have one (we pride ourselves in only having one plan ; that is not to have one) is to spend the 10/11 festive season around Phuket yet again, do some diving, then head south in March to prepare to head down the Malacca Strait to Singapore, the north coast of Borneo and maybe then base ourselves on the eastern side of the Malay Peninsula for a change. Oops, we might end up going backwards!!! So, the Red Sea and Mediterranean via Suez Canal will have to wait for yet another year........or more!